*Instead of just taking one or two crawl steps, I started officially crawling! Daddy and Mommy were so proud. Although Mommy was a bit surprised at how overnight I suddenly started getting into everything. But come on, Mommy, I'd been waiting almost 8 months to explore like this!! *This week I tried biting Mommy while I was nursing and that didn't go over too well. My teeth made her bleed and she yelled at me and then I cried and cried. And then she was crying cuz she felt so sad. Daddy held me until I stopped crying, then I looked at Mommy and saw her crying and started crying all over again. Then I was scared to nurse because I didn't want to upset Mommy like that again, so Daddy had to sing to me to calm me down enough for me to finish my bedtime meal. It was a rather traumatic evening. *Toward the end of this week we flew to Florida to stay with Great Gran (Great Grandma Millie) so Daddy could play in his ultimate frisbee nationals. Great Gran was super excited to see me. Daddy had his first round of games on Thursday and me and Mommy stayed all day so he'd know how much we love him. 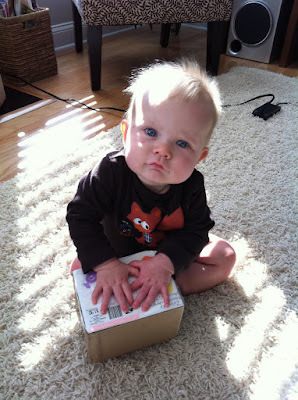 I got a present in the mail from Great Aunt Sandy and Great Uncle Jeff!! 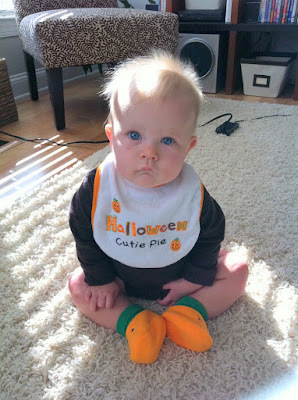 And then Mommy made me wear it even though it wasn't Halloween yet. 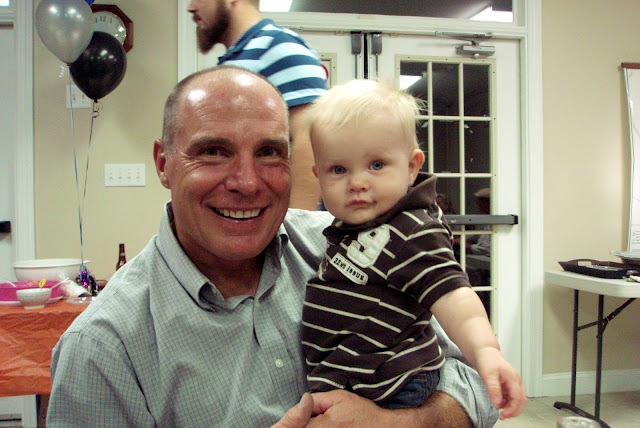 Hanging out with cousin Taylor at Grandpa's birthday party. My family on that side. Sleeping on the airplane on the way to Florida. Hanging out with my friend Haley on the fields. I got so excited that I scared her away and she hid from me. I tried to chase her down but Mommy held me back. I had some crazy sunscreen hair that day. *We stayed with Great Gran all the way till Monday of this week so that Daddy could play lots of frisbee games. He played on Thursday, Friday, AND Saturday!!! Holy cow I would have been so tired if I was him. I hung out with Mommy under the tent. She let me crawl around and play with grass and eat puffs. When I got sleepy she'd hold me or push me in the stroller until I fell asleep and then let me take a nap in there. It was a pretty great time. 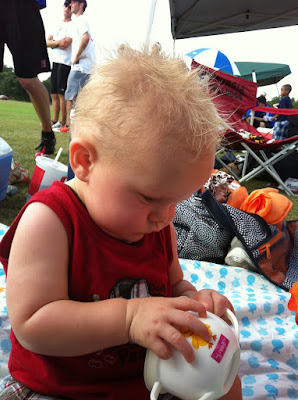 *While we were on the frisbee fields, Mommy held my hands and I walked (supported) for the very first time! I thought it was such great fun, I giggled the whole time. So Mommy walked me all kinds of places, and I giggled and giggled. *This week I got super good at crawling and at getting to a sitting position from my belly. It makes adventuring a lot easier. I especially love crawling to the dogs' beds and trying to climb in. Crawling is just so awesome. I never have to whine at Daddy or Mommy because I can't get back to the position I want. I'm just always how I want to be. *Unless, that is, they put me on my back. See, somewhere along the way, I seem to have forgotten how to roll over. I know that sounds silly, but I'm very serious. I can't remember how to do it. So if Mommy or Daddy put me on my back, I'm like a beached whale. I can't move. And I get super fussy super quick and start yelling until someone helps me flip over. Mommy keeps putting me on my back, thinking I'll figure it out again, but I see no sense in this. I don't need to lay on my back anymore. I can crawl. So cut it out, Mommy. Mommy bathed me in Great Gran's sink. I liked it cuz I could reach lots of things I wasn't supposed to reach. Oh please oh please just let me sleep. Showing my Halloween spirit a day early!! Resting with my Daddy after his games. Watching the finals game with Haley on Sunday. I can't find my puff. Have you seen it? Mommy trying to show me the water. I didn't like it one bit. Daddy showing me a seagull. *I turned 8 months old this week!! Check out my monthly pics with Mr. Alligator here. *This week I started waving at people, and wow did everyone get excited. At my Mommy's Bible study, all the girls were waving at me at once!! And they were all so proud. Especially Mommy. *This week I also started getting lots of stranger anxiety. I whimpered when Daddy took me to Eileen on Monday for daycare, I cried at Eileen's when one of my friend's daddy came to visit, and I also cried when Daddy and Mommy tried to let their friends' sons watch me in another room during their church life group. I just really prefer to be with my Daddy and Mommy right now. Sorry, everyone else. *I'm getting super good at eating grown-up food now. (In little pieces, of course.) Mommy gives me pasta and chicken and bread and all kinds of yummy stuff. *This week I also decided to sometimes go to bed when other kids my age go to bed. Two nights I fell asleep at 7:30 pm. Mommy and Daddy didn't know what to do with themselves when I fell asleep so early. In fact, they were so bored without me that they went to bed early, too. Or maybe they were just tired. I dunno. How exciting that he walked (even if it was supported)! He's getting so big. I love all that blond hair! You are a busy little guy aren't you? Happy belated bday to your grandpa and be gentle with your mommy. 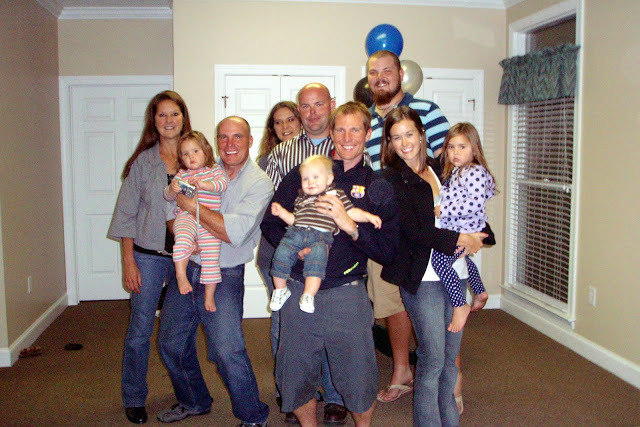 So cute :) I noticed in the family picture that Dave and his dad seem to hold babies the same way, with knees kinda bent.